Last evening, the New York Yankees were leading the Oakland A’s 2-1 in the eighth inning. Yanks reliever Kyle Farnsworth just got the second out of the inning when he was pulled from the ball game by manager Joe Torre in favor of closer extraordinaire Mariano Rivera. Farnsworth proceeded to storm off the field and then angrily threw his glove in disgust once he reached the dugout. -having allowed two base runners in the 8th with his team nursing a one-run lead. -a left handed hitter coming to the plate (lefties are hitting .295 against him). -being replaced by maybe the best closer this game has seen. So my “Sports Einstein of the Week” goes to Kyle Farnsworth. I guess he believes he knows more than manager Torre, who has only managed four World Series winners, and also thinks he’s better qualified to get a big out than a guy who has over 400 career saves. Goal update: June weight loss. Well, I went from weighing 205.5 at the end of May to 205.0 at the end of this month! I had a feeling I might be up a little given that my eating habits over the past two weeks haven’t been very good. That should tell me that my increased exercise habits are taking effect. It should also remind me that a better diet would get me to my ultimate goal of 195 lbs. a lot quicker. It looks like I have to reset that goal once again. I'm now shooting for Labor Day, which is a little over nine weeks away. With half of 2007 over, I am down a total of 13 pounds since January 1. 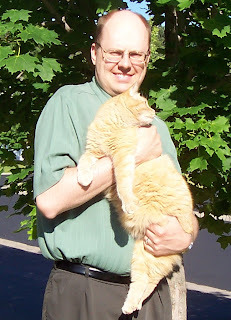 To put that in perspective, I decided to post a picture of me with our cat Macbeth. Mac recently went to the vet and weighed in at right around 13 pounds. Lugging that big beast around helps me to realize the progress I’ve made in that I’m not carrying that much weight on my body anymore. In an appearance earlier this week on MSNBC’s Hard Boiled Hardball, Ann Coulter was greeted over the phone by Elizabeth Edwards, wife of Democrat Presidential candidate (and renown trial lawyer) John Edwards. Mrs. Edwards called in to politely ask Ann to cease with the personal attacks on John Boy. Never mind that John Edwards has blamed President Bush for the radical Muslims hating us or manipulated juries by saying handicapped children spoke through him. He even took to raising money by exploiting Coulter's incident of calling Edwards a homophobic slur a few months ago. No, Edwards can’t be attacked. After all, he’s only running for President of the United States. Sheesh, not only are the Democrats trying to revive the Fairness Doctrine, but now they’re having spouses calling conservative commentators telling them to cease with speaking out. I forgot to check in over the weekend with a report of my Friday night endeavor. I hung out with my bro and Mom that evening as they had an extra ticket to see David Spade at Grand Casino Hinckley. “See David Spade do what?” you may be asking. Apparently, Dave tours periodically as a standup comic. Who knew? All I can say is that I spent the entire one-hour performance pining for a Joe Dirt sequel. Sports Einstein of the week: Tank Johnson. Since Roger Goodell took over as NFL commissioner last year, he has come in with a “new sheriff in town” mentality. That is, he has implemented a new NFL Personal Conduct Policy which scrutinizes the off-field behavior of players. Given the enormous number of off-field incidents and arrests over the past couple of years, Goodell has not been shy in handing out stiff suspensions to players. The most high profile case has been that of Tennessee Titans CB Adam “Pacman” Jones, who has been suspended the entire 2007 season. But my “Sports Einstein of the week” has to go to Chicago Bears defensive lineman Terry “Tank” Johnson. Johnson has already been suspended for eight games in 2007 for his conviction on weapons charges. However, commissioner Goodell has said he would consider reducing the length of the suspension if Johnson stays out of trouble. Certainly that would entice Tank to keep his nose clean, right? Johnson was arrested by police in Arizona on Friday, heaping more trouble on a guy already suspended for the first half of the 2007 NFL season. Johnson was arrested for driving under the influence to the "slightest degree" after an officer in Gilbert, Ariz., curbed him at 3:30 a.m. for going 40 mph in a 25 mph zone, police said. I guess we shouldn’t expect too much from a guy who keeps in his home loaded assault rifles in full view of young children. Is popular game show coming up "Rosie"? After 35 years as host of the popular game show The Price is Right, Bob Barker has chimed in as to who his successor should be. Bob Barker endorsed his friend Rosie O'Donnell as a possible successor on "The Price Is Right," although the newly retired host isn't sure CBS wants a woman to take over the game show. "She knows the show," he said. "There's no doubt in my mind she could do the show. Now, whether they want a lady host, I don't know. I've never heard that discussed. As far as I know, they've only auditioned men." If Rosie has to remain in the spotlight, I’m certain this would be a rather harmless venue. After all, there wouldn’t be many opportunities to spew her political venom. However, I am curious as to how she would conclude the show. This is Bob Barker reminding you to help control the pet population. Have your pet spayed or neutered. Goodbye, everybody!! This is Rosie O’Donnell reminding you to help control the infant population. Do not allow Catholics on the Supreme Court. This is Rosie O’Donnell reminding you to not fear Al-Qaeda. They are mothers and fathers, too. Hi ya! Haven't seen you in a while, geez, you look great...did you, uh, get a haircut or something? Huh. It suits, it really does. Why, thanks for noticing Katie. And welcome back!!! Gosh, Jen & I were starting to purchase cartons of milk as opposed to the plastic containers. We thought maybe the side of said carton would be featuring your picture. And we were more closely scrutinizing the little “Have you seen me?” fliers that show up in our mail every other week. Seriously, it is great to have you back!! Are you and Miguel planning on attending the MOB gathering at Keegan’s July 14? Dennis Miller blasts Harry Reid. Dennis Miller’s recent smackdown of Senate party of surrender majority leader Harry Reid is vintage Miller in that it cuts like a knife…and uses rather obscure references. I took the liberty of researching some of Miller's historical and pop culture annotations. I’m bemused by the fact that the libs fancy themselves as young idealists who are gonna shake it up, and then they’re forced to fall in behind Dorian Gray’s lighting stand-in. 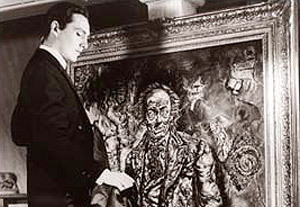 A reference to the title character in the Oscar Wilde novel, The Picture of Dorian Gray. Yes, Harry Reid’s resemblance to the portrait of Mr. Gray (above) is indeed uncanny. If it’s possible to make Mr. Limpet sound like Demosthenes, Reid does it every time he opens his ashen piehole and haltingly forces out that tremulous pale-gray oratory that sounds like it’s oozing from a stuck caulking gun. Mr. Limpet was a character in the 1964 Walt Disney film The Incredible Mr. Limpet. The title character, played by Don Knotts, was a weak, spineless man who was turned into a talking fish. Demosthenes was a Greek orator back in the 300s B.C. I think he believes that getting his negative comments in early could be the one chance that a non-entity like he has at a place in history. His is a mediocre man’s Thermopylae. Thermopylae is another Greek reference, more specifically as it relates to the Battle of Thermopylae of 480 BC. An alliance of Greek city-states fought the invading Persian Empire at the pass of Thermopylae in central Greece. The battle is said to have inspired all of Greece to band together against the Persians, and helped usher in the world's first democracy. It made Miller's rant monologue all the more entertaining once I better understood the notations. Obviously, the phrase “Sports Einstein” is meant to be ironic in that some major college and pro athletes aren’t your sharpest individuals. "It's going to be different," he told the Indianapolis Star. "I know it rains a lot. I know it's close to L.A. and I love that. I want to go to L.A. and go to the beach." Who can blame Oden for being excited about being a mere 964 miles from Los Angeles? In the motif of “Where’s the Beef?”, another elderly lady protests the lack of….border security. On Wednesday in Vatican City, an attack against the Pope was thwarted. A German man tried to jump into Pope Benedict XVI's uncovered popemobile as the pontiff began his general audience Wednesday and held onto it for a few seconds before being wrestled to the ground by security officers. I’m certain the Pope forgave the man, but…..
At least eight security officers who were trailing the vehicle as it moved slowly through the square grabbed the man and wrestled him to the ground. ….the security officers were not so merciful. Hey Laurie, I hear Antarctica is now a pleasant place to live. I don’t know much about Larry David, other than the fact he was part of the brain trust for the hugely successful sitcom Seinfeld. But one thing I’ve learned recently is how he must have attained good instincts. Comedy star Larry David has split from Laurie David, his wife of 14 years, according to reports. Laurie, who produced Al Gore’s propaganda piece documentary An Inconvenient Truth, has been one of the biggest, most vocal demagogues on the global warming issue. Since she’s good pals with Sheryl Crow, I’m sure Laurie was kicked to the curb by Larry before she enacted Sheryl’s suggestion of one square of toilet paper per restroom visit. Or perhaps it could be Laurie’s constant fawning over Gore as if he were the second coming. Goodness gracious, every time I see this woman within five feet of the human snooze fest former VP, I’m thinking “get a room”. Who said there's no such thing as a stupid question? Last time I was home I was driving around I had a flat tire, I pulled my truck into one of these side-of-the-road gas stations, the attendant walks out, looks at my truck, looks at me, I swear to GOD he went, "Tire go flat?" "No I was driving around and those other three just swelled right up on me." This past Saturday morning our street was being resurfaced. All residents on our street were required to have their cars parked elsewhere so the workers could complete the task at hand. My wife and I parked our two vehicles a block away the night before. As I was heading to my car Saturday I was asked by one of the 20-something workers if all my vehicles were moved since there were still some parked on our street. Instead, I merely answered “yes” and went about my business. "Sheff" cooks up absurd theory. With all of the progress African-Americans have made in this country over the past 30-plus years, you would think there is still major oppression occurring when listening to some public figures. Now, the cries of “oppression” seem to extend to Major League Baseball. The percentage of African-Americans playing Major League Baseball is at an all-time low and Gary Sheffield says he has a theory why that's the case. In an interview with GQ magazine that's currently on newsstands, the typically outspoken Tigers designated hitter said Latin players have replaced African-Americans as baseball's most prevalent minority because they are easier to control. "I called it years ago. What I called is that you're going to see more black faces, but there ain't no English going to be coming out. … [It's about] being able to tell [Latin players] what to do -- being able to control them," he told the magazine. "Where I'm from, you can't control us. You might get a guy to do it that way for a while because he wants to benefit, but in the end, he is going to go back to being who he is. So the insinuation here is that black guys in the Tampa area (where Sheffield’s from) lack discipline, causing them not to gain wisdom from coaches who can help them be better major leaguers. Sounds like career suicide to me. And that's a person that you're going to talk to with respect, you're going to talk to like a man. Ah, but that person can cause dissention on a team, say idiotic things to the media, and be more concerned with his own stats than his club winning. But he still deserves respect, huh? Got it!! "These are the things my race demands. What, the permission to undermine authority without consequences? Sorry, but no race in baseball should get by with that. So, if you're equally good as this Latin player, guess who's going to get sent home? The guy who isn’t the team player. And, according to you Gary, it’s going to be the black guy. I know a lot of players that are home now can outplay a lot of these guys." In your opinion. Which, given the absurd comments on display in the GQ interview, is hardly worth the paper it’s written on. According to a 2005 report by the University of Central Florida Institute for Diversity and Ethics in Sport, only 8.5 percent of major leaguers were African-American -- the lowest percentage since the report was initiated in the mid-1980s. By contrast, whites comprised 59.5 percent of the majors' player pool, Latinos 28.7 percent and Asians 2.5. The fact of the matter is these days fewer African-America kids are even expressing an interest in baseball. Many theories abound as to what is the main culprit. One that stands out is how young black kids believe the only way to making it in life is to be either an athlete or rapper, which is not only absurd but borderline tragic. Unfortunately, the high profile that is attributed to pro athletics or the hip hop genre is what enhances that belief. Baseball often doesn’t provide the instant millions that, say, a first-round NBA draftee can attain. In baseball, a player often has to slog along in the minor leagues for at least a few years, riding buses and doing their own laundry, etc. But if one is drafted in the NBA in the first round, the glamour and glitz of pro basketball is available to these players almost immediately. So when a young black kid is, say, 12-years old what sport do you think he’s going to focus on? Again, since he might believe that athletics is one of the few ways to make it in society, naturally he’ll choose what is perceived as the most lucrative. It isn’t that baseball is shunning African-American ball players. The sad fact is there aren’t a lot of those players available because of what appears to be declining interest. For Donovan, move to NBA is "win-win". After leading the University of Florida to a second consecutive national basketball championship this past April, coach Billy Donovan is headed to the pros. "My decision to come here had nothing to do with the University of Florida. ... This is a totally different environment," Donovan said Friday when introduced as coach of the Orlando Magic. Donovan and the Magic agreed to terms Thursday in a whirlwind deal that turned Florida basketball upside down. For a long time, he was said to be leaving. But he quieted speculation two months ago by declining a job at Kentucky. Donovan accepted a five-year, $27.5 million contract, which pays more than twice the annual $1.7 million he was making at Florida and the $3 million he was expected to earn on an extension there he had yet to sign. I find I’m in the minority when I say this is a good move for Donovan. Indeed, many point to the failings of other big-time college coaches who attempt a career in the NBA. Rick Pitino (192-220 NBA coaching record), John Calipari (72-112), Lon Kruger (69-122) and Tim Floyd (90-231) have all been held up as examples of college coaches failing to make it in the pros. It’s not that I think Donovan is a shoe-in to succeed. He may indeed fall flat on his face within the first few seasons in Orlando. But look at the coaches named earlier. All four have again found success in the college game despite taking a few years to coach in the NBA. Pitino lead Louisville to the Final Four in 2005. Calipari guided Memphis to the Elite Eight in ’06. Kruger and Floyd both lead their teams (UNLV and USC, respectively) to the Sweet Sixteen this past March. …and he’ll have made $27.5 million dollars during his hiatus from college coaching.